One of the most trending post in Nigeria online community, is that a Jealous Nigerian Air Force personnel, has just killed himself and his classmate/girlfriend in Benue state. According to recent news reaching our news desk, the Nigerian Air Force personnel who goes by the name on facebook, Lieut Kal has killed himself and his classmate/girlfriend, Oladipupo Solape a.k.a Shomzy Shomzy in Markudi Benue state over the weekend. According to their classmates who witnessed everything, Lieut Kal killed her out of jealousy. There was something quit disturbing and from posts made by Kal on Facebook, there were hints that he knew he will be doing this atrocity. Before Lieut Kal took this decision, he described yesterday as his last day as an airman and even wished himself ‘RIP’. It is believed that his last post which is ‘4:36’ was the time he killed the young girl in her room. 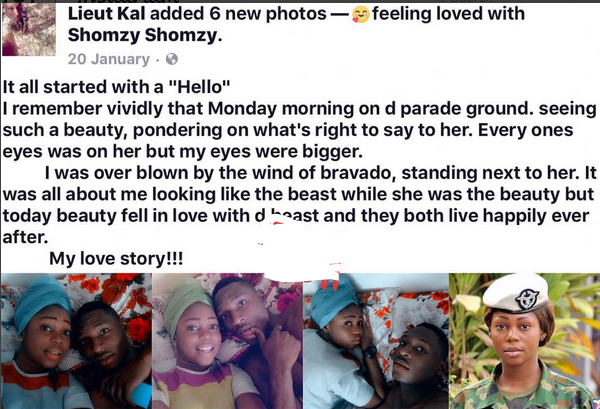 From what we have seen on Facebook, Lieut Kal is very much obsessed with the girl, as he tags her on all his post and has even declared that he could kill for her, which he eventually did. But killed her and himself. Shomzy however stopped tagging him in her Facebook posts since the beginning of this year, in January, 2018 indicating that they may have broken up. From Recent comments, we believed that Lieut Kal survived his gunshot. But is currently been treated and will face the full wrath of the law. Is this true love or Obesession? Personally, i don’t think this is Love, and for those who want to have Jealous Boyfriends or vice versa, then you’re on your own.